Our family's beloved apartment - part of what was once a castle - is recently refurbished with fresh paint and new furnishings. 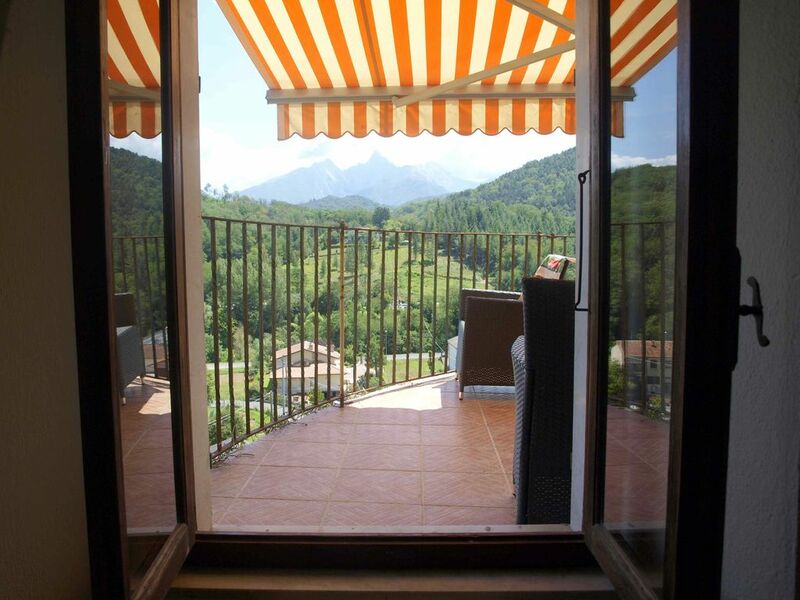 It has two bedrooms, a large and welcoming kitchen/living room, one bath, and our favorite space, the outdoor patio with a beautiful view of the Apuan Alps. Our patio is unique in our neighborhood, as it was once the base of a tower. This outdoor space has an awning for comfortable dining outside at any time of day. With high ceilings and thick stone walls, this apartment has a feeling of ageless serenity. Not a tourist neighborhood, this is an Italian village, where one is surrounded by Italian life. Also a large folding drying rack that works surprisingly well. About five hundred feet from the front door. There's a little village with shops at Soliera, you will find public transport very close by and the house is very near to Cinque Terre and to Pisa; it's about one and a half hours to Florence; to Lucca; or to Siena. We enjoyed our 5-night stay at this 2-bedroom property in the quiet charming small Medieval village of Soliera. The village is not a tourist town but an authentic little Italian village with cobblestone lanes and friendly people. The house is party of a 13th century castle, is comfortably furnished and has a great patio built atop a turret, that looks out at the lush green hills and houses of area in the foreground, and the Italian Alps in the background. WE took our meals at the dining table out there when home. There were three of us, girl friends in our 60s. We were there in mid-September and the weather was perfect. Not far from La Spezia, where you can catch a train to the 5 villages of beautiful Cinque Terra on the Ligurian Coast. This place was wonderful, particularly if you want to relax and not be in a tourist rat race to see everything in Italy. This place is a bit off the tourist route, not many locals spoke English even though we easily got by with what little we know. The house is very comfy and the view out the windows and on the balcony is spectacular. We found we had no need to go anywhere but back and forth to the kitchen to refill our wine glasses and get more cheese! The local village (Soliera / Rometta) was very picturesque, very old and just like a postcard. The local hills are filled with little mom and pop restaurants that served delicious food every bit as good as the more fancy (and expensive) restaurants in town. Just taking a evening drive into the surrounding hills was a joy, but be warned, the roads are very narrow, steep and windy. Aulla is about 6-7 miles away and it had every amenity we could want and then some, but the local stores had a great supply of the essentials...wine , cheese, crackers salami, and great fresh bread! The kitchen is well equipped to cook up a storm, the neighbors were friendly and helpful. It was a easy one hour train trip to Cinque Terra or into the local mountains. The train station is about 1/2 mile away with free parking. Bring a good book(s) and relax, the place is divine,..... and don't miss a sunset on the balcony! I used to visit a family home just a few doors up from this location. So I was quite familiar with the spectacular views. The apartment is well laid out and has most conveniences. We found it very useful visiting a pile of nearby places by car. Could have done with some milk in the fridge though. The apartment was clean and well-maintained. It is a mixture of rustic architecture and modern conveniences. The good wifi reception was appreciated. It was fantastic to wake up every morning, sit on the balcony and have breakfast while admiring the view of the mountains. The evenings aspect of the scenery was totally different to the mornings as we sat eating our evening meals watching the colours of the mountains change with the setting sun. We were met by Mirjam who welcomed us to the village and showed us around the apartment. She was in touch with us during our stay, making sure that everything was OK.
We are already planning our next trip and hope that we can stay in the apartment again. We would recommend this as a great place to stay. An apartment created from an old castle. It has everything that you would need in a home. We were able to cook and relax and enjoy the stunning view. The location seems remote but was an easy access to all the attractions that one would want to visit. Mirjam was very helpful and friendly. Look for the Spring water dispenser at the parking lot where Mirjam first meets you. 5 cents a liter and delicious. I look forward to staying there again. We just returned from our two week memorable stay in Soliera Village. The balcony had a view that one dreams about. The apartment was very accommodating We used it as home base to travel to such places as Cinque Terra, fishing villages of Lerici and Levanto, Parma, Florence and castles in Fosdinova and Pontremoli. Please note: Check in is 5 pm. Check out is 10 am. It is very important to be timely as our agent travels to meet you. If there is a delay or a problem please be considerate and telephone our agent. Parking is a three minute walk from the apartment. You may drive to the front door but it's a tight squeeze and you'll need to back out! The house is not suitable for wheelchair users or young children.